Changes to parking arrangements according to council ‘policy’ is to undertake a survey of all residents and requires a vast majority of responses in support. Was a survey undertaken? What has happened to council ‘policy’ that new developments will not be eligible for residential parking permits? What rationale could support the removal of 2 hour parking? Were residents informed, warned? Where is the data to support this? Is council monitoring this street and fining drivers if they break the law? I lived in North Fitzroy in the 1970’s when the suburbs became inundated with traffic and parking became hot issue with locals. The end result was a complete traffic management plan area by area, Street ends were closed at to stop the rat-runs, residents parking permits were introduced (badly). Our Glen Eira managers just sit back and pretend nothing is happening. Vote out this lazy lot of seat warming councillors and try and replace them with people than with side with the residents and not with the bureaucrats. Also agitate for the removal of the non preforming senior planning bureaucrats, which is just about all of them, PB the most glaring example of a overtly anti-resident officer who is well past his use-by-date. Pretty unbelievable stuff. Plenty of streets are having 2 hr parking put in and this one gets all day because it helps out the developer. No wonder they can front up to vcat and not have any objections to waiving car parking and say that a street around the corner is there for them to park. We have morons running the joint who don’t give one iota’s thought to what they inflict on people. I don’t remember seeing one vcat judgement reported here where council challenges the developer’s claims about suitable parking so that waivers are given. Officer reports that go to council almost always say it is okay to waive visitor car parking too. Then there is the hypocrisy of some councillors like Okotel in the past and even Hyams saying that council has to adhere to its policies and if they don’t then they can’t expect vcat to. Well the car parking numbers are “policy” and it doesn’t mean a thing to this council and its councillors. If it helps out the developer then this group is all for it. 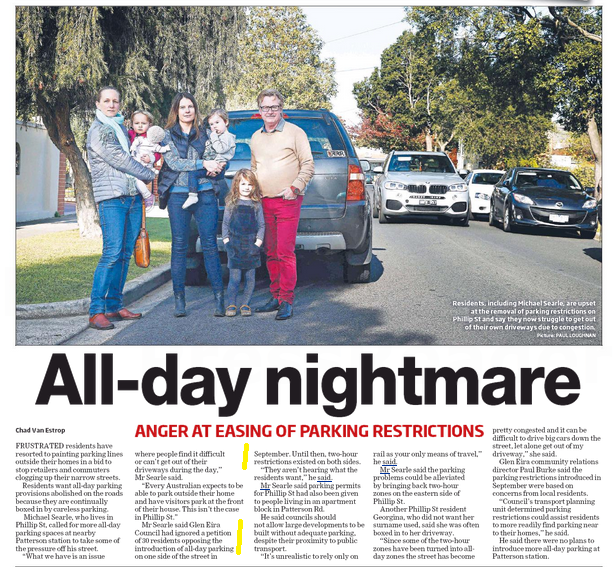 There are parking nightmares springing up all around Glen Eira. Streets so badly congested that only one lane of cars can proceed, all this has sprung up very quickly. Streets that moved freely just a year ago, are chronically stuffed now. Still the traffic engineers with their Voodoo Science pass no objections or requirements to any new developments, it just a “she’ll be right Jack” mentality, the system failing residents. Its time to get rid of the system managers this so called managers offer nothing to residents and all to developers. We should put people it these positions with answers or at less willing to have a go. Our lot presently ensconced at the Town Hall is a bunch of over-aged failed bureaucrats with nothing to offer resident, whilst bending over backwards to offer everything to their developers mates. We residents pay the bills and its about time we started to act like employers and shake the whole lazy town hall lay-abouts out of their trances and get some results for the money they take. Which are the Councillors to be chucked out!? In 2005 Hyams and Esakoff were sacked and people voted them because some residents do not care and do not read Moorabbin Leaders but check them out in garbage. A good number of houses do not get the payment. Esakoff is not a problem. She will go with the majority and won’t want to shake the boat. Hyams, Lipshutz, Magee, Pilling all have to go and then there’s real doubt about Sounness, Lobo and Delahunty. Add Ho to the have to go list too. Anonymous 9/6 @ 9.18 am – please come out from hiding under the rock and be a human and stand for next Council elections. Your uneducated guess that all Councillors be sent packing may be correct, in that case will you then stand as a candidate with your stone on your head? You have no bloody guts but hide behind the name “Anonymous” – put your rates where the money is. There are many new candidates standing for election and you can be one that challenges the others. Ok? Great picture. Rat wouldn’t squeeze through this traffic only trucks for developers who get to take over footpaths and streets. We have the same problem. The transport planners have no idea. In our area they applied 2 hour limits to a street near a shopping centre with barely any traffic forcing all day parkers to the next which is an extremely busy street. So we can not only not park in front of our homes but often have to walk some distance to get to our homes. Hopefully we will throw out this incompetent council and replace it with one that actually works in the ratepayers interests not for those who live elsewhere and who use our streets for free all day parking at our expense. Who played the broken record again and again saying there is nothing new in the residential zones? First Council to initiate the zones. The decision to change from 2 hour parking to all day is incomprehensible. 2 hour parking was introduced because the street was already busy and parked out. What do they expect will happen that it is now all day?